This was our first visit to Crete and it certainly won't be our last. It was made even more enjoyable because we chose Villa St Nicolas. The villa inside is fabulous, the views from the terraces are outstanding,outdoors the pool, jacuzzi, the covered barbecue area, outdoor TV large outdoor dining area all go towards making a wonderful holiday. The villa is in an ideal location although the use of a car is essential please do use the taxis if like us you are dining out of an evening,the service they offer is outstanding and it's a set charge of 8€.The cars are immaculate and the drivers are so courteous,just another plus to your holiday. Antonis the owner of the villa is always available if you need him, he sent us a very informative email before we arrived which contained information about the villa and Agios Nikolaus and surrounding areas, we found this very helpful, thank you Antonis it was a pleasure to meet you, also Antonis's father who visited his orchard near to the villa he brought us roses cut from his garden and pears from the orchard,another very nice man. I could go on and on we had a fabulous holiday, don't just take our word go and see for yourselves. Efharisto Antonis. we just came back from 12 days in agios nicolaos and must admit we had wonderful time.villa was beyond our expectation,specious,well equipped,very clean and modern,big swimming pool,lovely barbecue area,beautiful view! nice quiet location close to town centre,supermarkets,restaurants etc(we rent a car so it was very easy).Antonis is amazing host we took his advises and visited many places which are just 20-40 min by car eg.south of crete irapetria with beautiful chrissi island,zeus cave in the mountains and local areas eg.elounda.There is plenty to do there after day of trip you can enjoy and relax outside of the villa admiring amazing view of sea,mountain or relax in jacuzzi (which we use on daily basis ). We recommend this place for everyone and will be back next year!!!! The villa was very good, close to the beaches and to the town centre. Very beautiful barbecue and pool. Big thank you to Antonis for the attention. We had a great holiday. We will gladly go there again. We just returned from a wonderful stay at Villa St. Nicolas. We traveled as an extended family -- me, my husband, our two daughters ages 10 and 12, and my parents - and a great time was had by all. First, there is a very large driveway/parking area out front which could easily house several cars. The villa itself is lovely. Very modern, with high-end appliances and amenities (flat screen televisions, room safes, and fluffy bathrobes in every room.) We greatly appreciated the thoughtful provision of Wi-Fi router access points on each floor (there are four) and a dedicated router for outside. We could all get a flawless signal from wherever we were, which was an unexpected luxury. As mentioned, the villa spreads onto 4 levels, with a generously-sized en-suite bedroom on the basement level (the room was very light and airy, and had separate walk-out access to the outside), two bedrooms on the second floor, each en-suite and with balcony and water view, and a good-sized loft bedroom on the attic level, also with en-suite. My 12 year old daughter loved having her own little apartment suite up there, though note that bedroom might not be as suitable for very young children or seniors as the steps up are quite steep. The kitchen is compact but well-appointed with every modern appliance. Owner Antonis provided an extremely generous "welcome pack" upon our arrival, which left us well stocked with juices, coffee, milk, wine, bread, breakfast meats, and much more. There is ample comfy seating in the living room, which walks out to a lovely, well-maintained outdoor area with pool/Jacuzzi, sun loungers, covered BBQ area with table and additional seating, and a small grassy area. The view out to the water and Agios Nikolaos is stunning. The week we were there Antonis was caring for three 8 week old puppies who had been orphaned shortly prior. They were housed in a large outdoor pen in an olive grove about 50 meters behind the villa. Antonis was concerned and very solicitous that the puppies might make noise and disturb us. Quite the opposite - my daughters were thrilled to have puppies in residence, and Antonis generously granted them open access to the pups. They (we all, actually!) spent many a happy hour frolicking with the puppies that week, and we are thankful to Antonis for his kind indulgence. The villa is well-located with respect to the town. A bit too far to walk comfortably to the marina area in the summer heat (around 55 minutes or so), but about a 25 minute walk downhill to the closest small grocery store. The center of town (and a large Carrefour supermarket) are only about 6 or 7 minutes away by car. We had a bit of trouble finding the villa initially, as there are no street numbers in that part of town, but Antonis (who was out of town that day) sent his father to meet us in town and guide us in. All in all it was a fantastic stay. The villa suited our needs perfectly and Agios Nikolaos is enchanting. My one suggestion would be to make available manuals/instructions for the appliances for those of us not well-versed in German gadgetry. However, we managed to figure it all out with some help from Google and the free Wi-Fi! We will look back fondly on our time at Villa St. Nicolas. Excellent service from the owner, couldn't of been more helpful. Visited us on our first morning and gave us names and locations of excellent beaches and restaurants. The property has everything you want from a holiday home, all mod cons internally, lovely swimming pool and excellent BBQ area, which also included a pizza oven. Car is essential as the property is a 40 minute walk to the town. We stayed as a group of 4 for the second week of June 2015. We had a late flight so arrived in the middle of he night however the directions and access were simple and effective which was fully appreciated after a long day of traveling. The villa has a huge drive to the front with plenty of space for many cars. Inside the villa was spotlessly clean, spacious and finished to a high standard with top of the range fixtures, fittings and appliances. We had originally booked as a group of 6 and were worried that it would feel 'too roomy', however we felt very comfortable. At the same time there is plenty of space for a group of 8 and the layout is well thought out. The view from the pool area and bedrooms is fantastic, looking out to the sea, and across the bay to the other side of the island. Antonis, the owner, is very helpful and professional. He will leave you alone all week if that's what you want, or he can be on hand to help you with any issues whenever you need him. We have just returned from two weeks at Villa St Nicolas with three of our adult children & their partners & we all had a fantastic time. The villa is spacious & extremely comfortable, well equipped with everything you could possibly need. Antonis was very helpful with recommendations of restaurants etc & dealt with a couple of small queries we had immediately. Car hire is essential as there is no where in walking distance but Agios Nikolas is just a 5 minute drive & €8 by taxi. The BBQ & outside oven were excellent & we made good use of them. The beds are very comfortable & bathrooms had the best showers I've ever had in Greece! The pool is lovely & plenty big enough especially with the added luxury of the whirlpool. We would definitely recommend this villa for a relaxing & comfortable holiday. We stayed here for 3 nights after touring the Island and it was a great way to end our holiday in Crete. The villa is extremely well equipped with excellent wifi and TV on all floors. each room has an ensuite bathroom. It has an amazing view and the swimming pool is gorgeous. The owner Antonis is very helpful and we found the whole experience very relaxing. The villa is a bit difficult to find as it is on an unmarked road but it is only 5 minutes drive to the centre of Agios and 10 Minutes to Elounda. We would recommend this to everyone except perhaps families with small children as the stairs are quite steep and the swimming pool is right off the house. A great place for family gatherings and groups of friends. The Villa is Perfect for quite and relaxing holidays with family or friends. Antonis the host helped us with good tips for restaurants and sights. We will come back! The house is well equipped and maintained! Stunning location, stunning villa. Had a wonderful time just relaxing. Loved sitting by the pool each evening with a glass of wine. Antonis was very attentive and ensured our holiday was something to remember. Thoroughly enjoyable stay from start to finish, some very minor issues that were sorted immediately. We also paid for a cook in the evenings, this was a wonderful addition to the holiday experience - had we been 8 adults it would have been fantastic value but the 4 parents all ate well and it was wonderful not having to cook each evening. Well worth the money and was certainly cheaper and far less hassle than eating out each night. The Manager of the property looked after us extremely well and helped whenever we want help from car rental to ideas for day trips etc. Nous avons passé 8 jours dans cette maison à 2 couples avec nos 2 enfants chacuns. La maison est superbe, trés confortable et les prestations sont haut de gamme. Le propriétaire Antonis est trés gentil, trés disponible et donne de bons conseils sur les endroits à visiter. A recommander. Seven of us stayed at Villa St Nicholas in August 2013. We had a wonderful week. The villa is great � it�s got plenty of room and all the amenities you could need. The pool and house are really clean and the furniture, appliances and crockery are of a really high standard. The villa is only a short drive from Elounda and Agios Nikolaos and it's got an amazing view. Any problems we had were soon fixed with a quick call to the owner - who is very welcoming and helpful. We think the villa could benefit from an instruction pack explaining how to use the oven, dishwasher etc and a sign post to help people find it(!) but apart from those small things it is a great villa and we had a wonderful holiday!! Marvellous and amazing villa with cordial host hospitality. Superb, delighted and highly appreciated place . We had a rest at St.Nicolas villa for ten days in June 2013 . There was lovely ten days for three families with children of 2,5 and 8 years. Villa located in ten minutes of a driving from the center of Agios Nikolaos. So to rent a car highly recommend. Marvellous and beautiful arrangement of a villa with amazing view of Mirabello's gulf. The spacious territory with the pool, jacuzzi, barbecue and palm trees are delighted. There is four cozy sleeping rooms , two of which with specific terrace. Suitable kitchen and a drawing room, dining room overlooking the pool. Everything to feel most comfortable and enjoy the rest. Modern, smart and hi-tech design of the house with stylish furniture and luxury equipment worked properly! All this made our stay and rest in Crete magic and unforgettable. Superb, delighted and highly appreciated place. But more than this� The benevolent and helpful host Antonis fascinated us with hospitality and care. With the first minute his support and friendliness were felt . On our arrival I was pleasantly surprised the filled refrigerator , after flight it was very opportunely. He introduced us the best sites, beaches, tavernas with authentic Crete kitchen to visit and enjoy. Antonis did not disregard any our question until the last minute. We received the mass of pleasure from Crete holiday, and especially from rest and cordial host hospitality . In our opinion St.Nicolas is the best villa for groups in Agios Nikolaos suberb. Our heartiest thanks, Antonis, for the toy dog ( forgetten) and post us as well . We do hope to come back here more and more. From the moment we arrived right up to the time we left, the villa (and the level of attention from Antonis) surpassed our expectations. Our first view of the villa with it's circular driveway, extensive planting and the luxury boat parked at the side is something that we won't forget it a hurry, and our first look round the villa certainly didn't disappoint either. As a general rule welcome packs are poor, anything from one bottle of vinegar pretending to be a cheap bottle of wine, to bottles of vinegar pretending to be two cheap bottles of wine. Not this time though, yes, there was wine but it was nice wine, there was bread, cereal,milk, coffee, sugar, bacon, juice, the list goes on and on. The rooms are all very nicely decorated and furnished, the beds are comfortable with plenty of spare bedding, there is lots of storage space, and best of all not one bit of the hideous pine furniture usually found in Greece. The windows all have electric shutters, which work! The air con also works efficiently but without deafening you. There is WiFi in every room. The pool is lovely with plenty of outdoor furniture to meet every need and sitting in the jacuzzi on a hot afternoon was just so relaxing. The kitchen is well equipped if on the small side but unless you intend to do a lot of cooking it should not be a problem. Plus you also have a big barbecue outside if you want to be more adventurous. The bedrooms all have TV's but these probably don't get much use as the view from the villa is better than anything you will ever find on TV. So advice? You need a car. There are no shops in the village so if you run out of milk you will have to drive to the nearest supermarket. Carrefour and Lidl both have supermarkets nearby and there is a small local supermarket not too far away. While we were there the utility companies were putting in new facilities which did cause a minor inconvenience with such narrow rural roads, hopefully once the work is finished access will not be an issue. Don't sleep with the windows open unless you like listening to barking dogs. 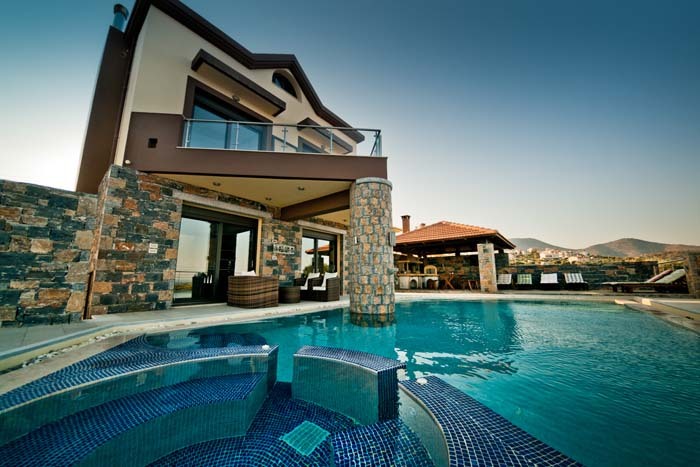 Don't forget your camera, you will want a lasting reminder of this lovely villa. We spent one week in villa St. Nicolas and it was gorgeous week! It locacated 5 minutes by car from Agios Nicolaos and 10 minutes from Elounda. Very clean house and big swimming pool. The house is new and it's fool of modern technics. Nice view from villa to Mirabello. The owner is very friendly, helpful and kind person, he gave us good advices for our holiday about restaurants and nice places to see. Great villa : spacious rooms, fully equipped kitchen, TV with dvd-player and satellite in every room. And the swimming-pool, let's not forget the private swimming-pool. Very nice view too. As we arrived very late saturday night, we were pleasantly surprised when seeing that we were graciously provided with food and stuff for breakfast. Going to the villa can be a bit difficult at first, especially at night but the explanations we were given were very detailed, just be careful not to drive too fast and miss a sign. Otherwise, the villa is 5-10 minutes drive from Agios Nikolaos and less than an hour from Heraklion. The house is so nice an calm, you could spend your whole stay not moving from there, except to do some shopping. Outside maintenance is efficient and you barely notice they were there. Only downside (and in no way related to the villa) was that lots (and I mean lots) of shops and tourist sites were closed because it was still too early. On the whole, we had a very nice stay. We stayed in Villa St. Nicolas for our family summer holiday in Greece, and I can honestly say it was one of the best hoidays I have ever been on! Antonis was the perfect host, showing us around his wonderful villa and clearly explaining how everything worked. The villa is simply beautiful - very modern, clean, all mod cons t make it a home away from home. The rooms were well appointed, spaceous, and a pleasure to stay in. The swimming pool was huge as well, and a great way to cool off in the hot afternoon sun! And when the sun goes down, there is a great BBQ area to cook up some local meat and fish - delicious! The great thing about Antonis was that he couldn't have been any more helpful. When we arrived he has filled the fridge with food and drinks to get us going, and then helped us plan the activities for our week in Crete, by pointing out local attractions and recommending the best tavernas, sites and beaches to visit. This was really appreciated and helped us make the most of our week. The location was perfect - close to Agios Nicolas which was great for exploring the island, as well as being close to the nearby villages of Elounda and Plaka, which are lovely relaxing places to visit. We hired a car which I would highly recommed to help you make the most of your time in Crete. Overall we were more than delighted with the villa and our holiday, would love to return again soon and wouldn't hesitate in recommeding the Villa for other people to enjoy. I have been visiting Agios Nikolaos for over 22 years and so it was always my location choice for my dream Wedding! I have many friends in the town and surrounding areas and would usually stay at a friends hotel but on this occasion i needed a 'home away from home' I was recommended the Villas by a friend, who was also my Wedding planner and wasted no time in viewing the website! I fell in love with Villa St Nicolas just from the pictures and contacted the owner Antonis immediately as the Villas do get occupied very quickly and usually a year in advance! Antonis was very accomodating and communication on email was always speedy and informative. As i do know the area very well, I was 99% sure that I knew where the Villa was located, but as I was visiting Crete in March 2012 (2 months before the Wedding) to finalise things, Antonis was very accomodating in allowing me to meet him at the Villa to 'get my bearings' and to also see first hand what the Villa had to offer! I was not at all disappointed! As you approach the Villa there is a vast circular drive, with so much space there was even a luxury boat parked! There is a side access to the Villa, leading directly to the outside garden/pool area which we made use of mostly, there is however a front door! The bedroom sizes do not disappoint either. Naturally as the soon to be married couple we took the double bedroom on the 1st floor, which was en-suite with the extra luxury of a jaquzi bath and access to the triangle shared balcony - stunning views to wake up to in the morning. On the same floor, next door to this room is the Twin bedroom, again with en-suite and access to the shared balcony. The next floor up is accessed by a quirky staircase that much reminded my 6 year old Son, Charlie, apparenlty of a 'Pirates ship' staircase. Its a little tricky to master the best and safest way to tackle the staircase, so I would not recommend this room for children under 6 or those who have difficulty climbing the stairs. This staircase leads to a very spacious Twin loft bedroom! Again with En-suite and child like 'spy window' (Again the words of my Son!) The main staircase in the house is quite steep and marble, but we had my Husbands 88 year old Grandma staying with us and although slow and steady, she managed to climb the stairs twice a day to reach her bedroom on the 1st floor. There is a toilet located just behind the lounge area, so no need for stair climbing 20 times a day! On the lower ground floor is the 4th Bedroom, It is literally the size of the Ground floor as sits directly underneath the lounge/diner and kitchen! Excellent if you have a small child sharing the room in a cot and it also has its own patio doors so you can access the garden/pool area easily via the few outside steps. The Lounge/Diner and Kitchen seem slightly smaller that i expected, but there were 6 adults, 1 teenager and 2 small children and we did not feel like we were on top of each other. The outside area was where we spent most of our time and the BBQ dining area is fantastic! I always hire a car and would suggest if you do not want to be confined to the Villa that you consider doing the same. Althought to get from the Villa, which is located in a village called Katsikia down to the nearest beach - Ammoudi Beach is only 4 minutes by car, the walk would take a good 1/2 hour. And on the way back it is all up hill! The Town of Agios Nikolaos is another 3-4 minutes from the Ammoudi beach also, so again a car would be useful. We did on occasions take taxi from the villa to the beach at around 7 Euro and to the town around 9 euro (one way) - depending on which driver you get!!! I usually rent a car for around 150 euro for the week so taking in to consideration that a taxi transfer from Heraklion is around 80 Euro, one way......you can see that car hire is the most cost effective! The Villa is very easy to find once you enter Agios Nikolaos. You need not go as far as the Town Centre and as Antonis is local he was usually around for any questions or queries and we would often see him cleaning the pool late at night so not to disturb us during the day! He was as quiet as a mouse! The Villa really was just as nice as being at home, with the obvious plus sides such as the weather and the hospitality, friendlyness and helpfulness of Antonis was a comfortating touch considering I had so much to be getting on with! Both myself and our families benefitted from the Villa and we would love to return to the Villa in the near furture! Thank you Antonis for a wonderful holiday! We stayed for a week in Villa St Nicolas. It was very well equipped, with large comfortable bedrooms and excellent ensuite bathrooms. The air conditioning was wonderful as temperatures rose towards 40C. The pool area was lovely with plenty of space for the sun loungers and the shady outside seating and dining areas were just what we needed. The owner of the villa Antonis was easy to contact and very helpful, he even offered to call our car hire provider on our behalf when we had a problem with our car- a replacement car arrived within an hour. The drive into Agios St Nicolas is very straight forward and takes less than 10 mins and there is a Carrefour about 5 mins away. Where to start, there was a part of eight of us 4 teenagers and 4 adults, the bedrooms were all large,with lots of storage/waldrobe space and mirrors for getting ready. They were separate enough for everyone to have their own privacy. The view accross the bay was outstanding. The only downside is we had to get taxi's into Agios Nikolas as it was too far to walk, however Antonis gave us a taxi number and we paid �8 euros for the taxi. We arrived quite late and was welcomed by Antonis, he showed us the basics and said he would leave us to settle in and call again the next day to answer any questions. He left a large welcome hamper, with all the essentials , bread /tea/ coffee milk , bacon, sausage's eggs, fruit juices, cereals etc even toilet rolls which was a thoughtful gesture. The next day he came as promised and answered all our questions, (how appliances worked etc) and showed us a map of places to visit and recommended restaurants to eat. The whole family had an excellant time and I would not hesitate to recommend this villa. A fab villa looking out over the sea. Out of town a little bit which we loved as was quiet but you will need a taxi or hire car to get anywhere. Taxis are very good and reasonable and a quick phone call. Villa is beautifully decorated and fitted out to a very high standard. Very clean and welcome pack of food and drink was exceptional. All bedrooms have TV's and DVD's which we don't normally use on holiday but great for keeping little ones quiet in the mornings! Swimming pool not heated so was a bit chilly at times but fine when the sun was out. Swimming pool and jacuzzi were great and well maintained. One bedroom in basement, 2 on first floor and one up some steep steps into the attic area. All ensuite and a great size with comfortable beds and plenty of bedding. Overall great place to holiday, we loved it. We travelled to this villa as two families with four adults and three teens. The accommodation worked well for our group and the facilities were perfect the view was superb and the comfort immeasurable. The pool was beautiful but due to the temperature only two of the children went in. This was a late autumn break and we were not sure what weather to expect so were relieved to find that there were inside activities for all the family and everything worked. The kitchen was extremely well equipped with top of the range goods. The coffee machine was a real treat once we had found where to by the beans. (try the small supermarkets in town). We only used the BBQ once as we didn’t really identify where to buy meat and the evenings were very cold so not conducive to standing around cooking. As a group we had quite a lot of techy kit with us such as laptops, ipads, ipods even a Wii all of which we were able to use and interface with the equipment that was there. We were quite happy spending days around the house and the pool relaxing and enjoying the company and I think this villa lends itself to that type of holiday. All in all a lovely property obviously there are still some jobs to do before it is completely finished but this did not have any impact on our enjoyment. It is quite possible that some or all of us may return to this villa in the future I have not bothered with attaching photographs as the ones on the website are accurate. This villa was everything that we were hoping for and more. Highly recommended. We ate out in the town a couple of times and once in Elounda and between the seven of us we did not have a poor meal. One of the children with us was on very difficult and restricted diet and there was no problem getting food specially cooked for him. See my restaurant reviews. This is a villa not to be missed! Top quality accomodation and facilities in an unbelievable location. The owner is attentive and keen to ensure you get the best from your stay in Crete. The views are stunning - panoramic views of the bay and distant mountains are mesmerising! You can't stop looking at it and the changing colours are a photographer's paradise! The villa is situated close to the lovely resort of Aghios Nicholas yet in a peaceful and secluded part of the bay. The infinity pool and jacuzzi was used a lot! Everything you could ever want in a villa holiday is available and provided to a very high standard. We would highly recommend it - spectacular location and wonderful villa. One small point to note - the top twin bedroom is up some very steep wooden steps - we sent the young adults up there! Excellent villa, very well equipped, and modern. Poool gardens and bbq area are first class, and everything is kept spotless. Antonis is a top guy and very helpful. Would have no hesitation in recommending this villa to family and friends.